Even before 2017’s floods, fires and explicit nuclear threat, the doomsday clock had been ticking towards midnight, spurred on by the warming planet and the hothead in the White House. Survivalists have been around since the 1930s, but all of a sudden, prepping (making plans for civilizational annihilation) started to feel like the not-crazy thing to do. But how to go about it? Become a one-person militia and stock up on camo and bullets? If you’re a too-rich tech bro, you disrupt the apocalypse: get Lasik, build a panic room and buy an apartment in a luxury tower submerged below the surface of the earth. Or at the very least you could get a few chickens and learn to can and pickle in the spirit of a 1960’s utopian commune. As speculative preparation and luxury homesteading become more mainstream, they have dovetailed with the broadcasting of lifestyle through aesthetic and dietary choices. While we flail towards an unknown future, we decide whether to prep or to simply accept our fate as the last generation of human beings, the ones that finally ruined everything. 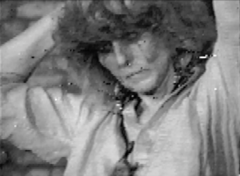 Asha Schechter is a Los Angeles-based artist who runs The Vanity East and is a partner in Potts. Hannah Black’s review of The Whole Earth: California and the Disappearance of the Outside curated by Diedrich Diedrichsen and Anselm Franke considers the legacy of the counterculture-cyberculture that largely shaped my childhood in Northern California. 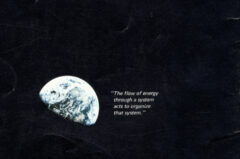 Black reminds us that the “Y” in DIY was not directed at everyone: “For Brand and those like him, the blue planet and, later, the exponential development of IT, meant that otherness and its attendant forms of suffering were just failures to get with the holistic, progressive programme.” This notion of us and them, rich and poor, prepped and not prepped, is the core value of apocalyptic speculation: Only some will survive the deluge so let’s keep out the riff-raff. This video of the Henderson House inspired me to get in touch with Mark Voelker to take a tour. The house was build by Girard Henderson (the former director of Avon) in 1978 and was a model residence for his company “Underground World Homes”. Voelker is part of the Alcor Life Extension Foundation, a group that purchased the Henderson House to entice High Net Worth individuals to sign up to be frozen. When he was showing me around the 15,200 square foot suburban luxury bunker, he explained that the only things they have added to the space are a demonstration Cryogenic chamber Mark described as “like a thermos, for a person” and two stripper poles. The Flintstones style BBQ embedded in a fake rock and the grotto-like pool are all original. This collection of PDFs tracks the evolution of the graphic design of Alcor’s magazine. From the dry zine-like feeling of the mid 80s, it moves into a sci-fi head shop aesthetic in the early 2000s, and more recently settles into the feel of a drab trade publication. Each issue features a chart tracking membership, broken down by geography as well as whether they are currently alive or have been frozen. 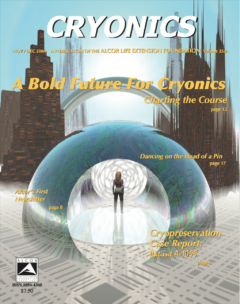 The magazine focuses on the cultural acceptance of Cryonics, recent scientific developments (like CRISPR gene editing) and an ongoing history of Alcor itself. There is something exhausting about reading Cryonics. The scientism seems at odds with the wildly speculative nature of the whole project. Freezing themselves to be defrosted in a utopian future where disease has been eradicated counts on a world where civilization continues and promises made to the dead are kept. 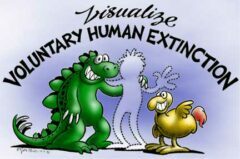 On the other end of the spectrum from life extension, consider the Voluntary Human Extinction Movement. Rather than desperately clinging to the hope of resurrection or extension like the Alcorians, their goal is to let humankind die out naturally, with the hope of restoring the earth to a healthier state. They take an oath not to reproduce; Their PDF newsletters “These Exit Times” outline their philosophy, “May we live long and die out.” Comics, charts, and earnest testimonials urge readers to get vasectomies — the Shakers did it better with wood-lathing. When first launched the Biosphere 2 was sold by the media to an eager public as crucial scientific research that would save us when the earth became uninhabitable. This was easier then explaining the complicated fact that many of its central ideas had come from an avant-garde theater troupe. But these performative roots were mirrored by Barbara T. Smiths “21st Century Odyssey.” When Smith’s boyfriend, Dr. Roy Walford, went into the Biosphere for two years she traveled around the world doing performances and communicating with him through then cutting-edge tech like faxes and video chat. While he and the other Bionauts were figuring out if self-contained life was possible, she was the Odysseus to his Penelope. How (and why?) do you decorate for the end of the world? At Terravivos it depends on your market audience. They are currently selling space in a luxury bunker in Europe that features wall-sized screens, a salon and a massive pool. The already dated looking suburban style communal living shelter in Indiana is almost completely booked. And their most recent option is a repurposed military facility called X-Point in South Dakota. X-Point features $25,000 bunkers situated in an “epic, secure, off-grid, high-altitude survival community” with what is described as “like-minded” people. Their shelters are marketed with the language and graphics of a gated community timeshare combined with a sense of inevitability that one of the SHTF scenarios described (Killer Comet, Planet X, Bio War etc) is just around the corner. Atlas Survival systems in Montebello was started by a man who makes luxury metal doors for Beverly Hills homes. After having difficulty finding a proper bomb shelter, he decided to build his own. Visiting Atlas, you only get a whiff of the Right Wing Prepper tendencies that seem to inform the place, like a magazine they make about bunkers with a cover showing an armed man surveying the landscape behind a stack of sandbags. On their website, hundreds of photographs show their corrugated metal shelters furnished in a midwestern style, complete with decorative oar, a painting of dogs playing poker, and large wooden letters spelling out FAMILY. But it’s not all family values. Another outfitted with a sign that says “Danger, Man Cave Enter at your own Risk” feels more literal than usual, given the circumstances. Included here is a 318 page PDF of the very thorough Nuclear War Survival Skills hosted on their sibling site ki4u.com. This unspeakable horror was prepared by Stylus, a “global innovation research and advisory firm, which works with businesses to stimulate innovation and growth”. Full of quotes like “Globally, 69% of UHNWIs have become more conscious about displaying their wealth in public over the past decade,” it’s a guide to trends in maintaining wealth and well-being while assuring nobody resents you for it. 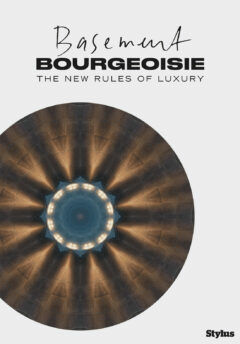 There are suggestions for how luxury brands can stand out through charity or “meaningful minimalism” and coerce the desired UHNWI’s to their brands. Also included are tips for where and how to hide when society crumbles. In times of uncertainty: stealth wealth.